Wow, this was one of the best concerts I’ve been to in a while. Sunday the 8th of August 2010 was a hot day, and while I know lots of people were down at Jiffy Lube Live for the Rockstar Energy Drink Mayhem Festival, I decided to stay cool and head over to the Rock And Roll Hotel for a killer line up of progressive metal. I’m really glad I did, this concert was just great. Cynic was the headliner, but I wanted to check out the opening acts, Intronaut and Dysrhythmia also so I got there a bit early. I got there a couple minutes after 7:30 and the opening band, Dysrhythmia was already playing their first song. They were great when I saw them play at the Velvet Lounge in February 2009 so I knew I wanted to get to the Rock & Roll Hotel in time to catch their set. If you’ve never heard them before, they’re an instrumental three piece from New York City that just shreds live. The bass player, Colin Marston is a member of the band Krallice and he also plays in the current version of Gorguts with Dysrhythmia’s guitarist, Kevin Hufnagel. Dysrhythmia’s songs twist and turn all over the place and rarely do they come back to playing the same riff again, instead their songs are constantly moving forward and evolving. That combined with the fast tempos that makes the music just really fun to listen to live. There are no words and really none are necessary as the music is totally engaging on it’s own. Really my biggest complaint with their set was the short length, but they were the first of three bands so it wasn’t really that surprising. They were a great way to start off this concert though. Next up was Intronaut. They’re a band from LA that I’m not as familiar with as the other two bands. 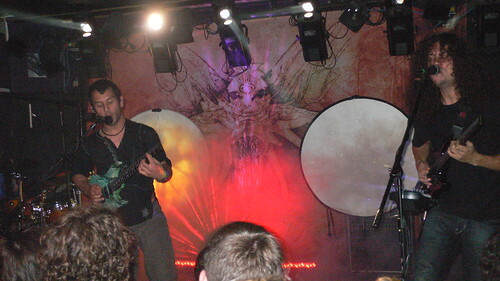 I’ve heard their 2008 album Prehistorisms and while I do enjoy it, I wouldn’t call it life changing progressive metal. They have a new album coming out soon and they played a couple songs from that live. They aren’t bad live and their rhythm section really kept the songs moving with groovy beats you don’t always get so much of in this metal sub genre. I was certainly impressed by their drummer, Danny Walker, in the live setting too, he really killed it back there. While their music is pretty interesting, they were pretty laid back on stage. Towards the end of their set the lead singer/guitarist, Sacha Dunable, asked the audience if anyone had any weed or whiskey before the Cynic set started. At the end of the song someone had brought shots to the stage for them, haha. Their final song of the night, Any Port, saw the other guitarist, Dave Timnick, put down his guitar at the beginning of the song to pick up a couple of mallets and pound on some upright (conga?) drums. He slung his guitar back on and continued to play the bulk of the song until he joined in at the end for the song’s drum solo. The rest of the band walked off the stage while he and Danny put on a rhythmic drum show that sort of reminded me of that old Sepultura song Kiowas, tho not so tribal sounding. It was a cool way to close out a good set, and I’m definitely going to check out their new album when it comes out. They certainly had left the audience warmed up and ready for the main act who was due up next, Cynic. When I came from the downstairs bar to watch Cynic the stage looked different. They had their backdrop lit up and they put up a couple of circle shaped screens. They started projecting trippy videos onto these and they turned on some funky lights. One could have mistaken it for a Pink Floyd cover band setting up, but this was much better than that. 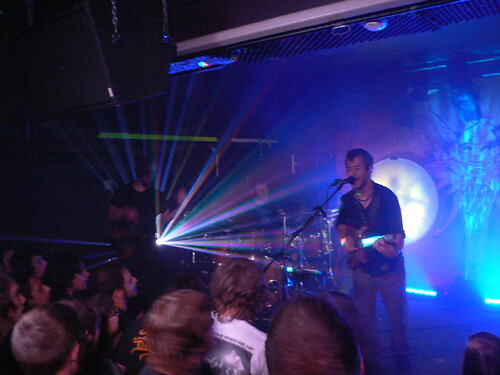 I’d never seen Cynic before, but everyone has told me they’re good live. They weren’t kidding, what followed was a fantastic set. Definitely one the best concerts I’ve seen in a long time, maybe the best show I’ve seen this year in fact. 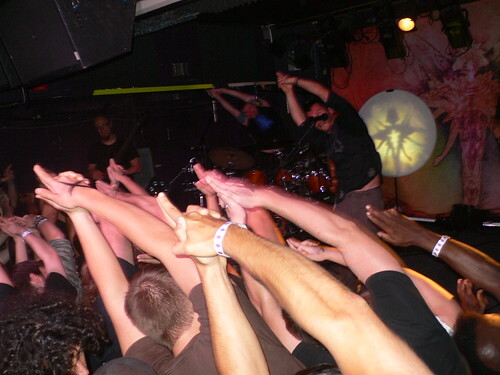 Cynic formed in Florida in the late 80s during the time the state’s legendary death metal scene was forming. Due to delays caused by two of the members touring with Death and then hurricane Andrew destroying their practice space as well as most of the state, the band only ever released one full length album, the classic Focus, before breaking up in 1994. One of the draws of this tour is that Cynic would be playing that album in its entirety. Since reforming they’ve put out another full length album and an EP, both of which I also highly recommend. For a band that started over 20 years ago they have a very small catalog of songs, which in their case I think worked as an advantage here. 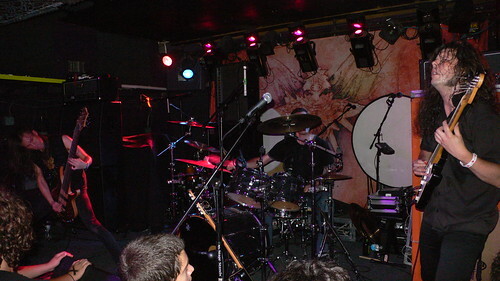 Since they have so many really good songs on those releases, the audience was treated to hearing most of Cynic’s songs live, instead of the standard “pick a song or two from each album” approach most older bands must do for their live shows. They started the show off with Veil Of Maya and continued through the excellent Focus album in almost top form. Guitarist Tymon Kruidenier apologized that he had lost his voice earlier that day so was having trouble keeping up with some of the growling. Luckily it’s heavy metal and the vocals are generally not the most important aspect of the music, certainly not in Cynic’s case. On top of that all the clean vocals (sung through a vocoder) were done by Paul Masvidal. Otherwise, the band was spot on. They obviously had played these songs enough to have completely mastered them for the live setting, guitars, bass and drums. Added with the cool light effects, this show was just mesmerizing. After playing Focus straight through, the rest of the band left the stage as Paul pulled out a nylon string acoustic guitar and played the song Integral off their latest EP, Re-Traced. This was a nice little interlude for the fans and a good divider for the rest of the show. When the band returned they played a nice mix of their newer material, and they even threw into the setlist the song Cosmos, which was un-released until it became a bonus track on the 2004 reissue of Focus. You couldn’t have asked for a better setlist for this show, and if you had a favorite song you were hoping they would play, they probably did. At one point Paul had everyone in the audience do a yoga stretch. A bit new age but I’ve got to admit that’s something I never thought I’d see at a metal show, everyone doing yoga. 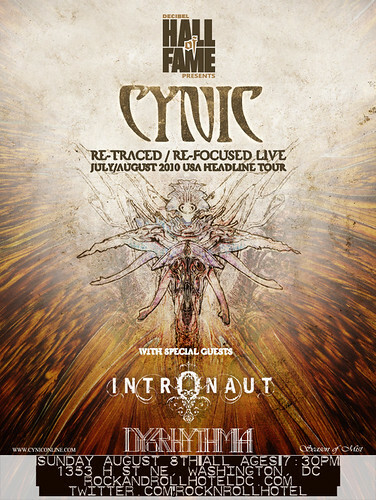 Overall Cynic put on a dazzling display of technical progressive heavy metal and showed that not only are they one of the genre’s older influential bands, but they’re also one of the current leading bands of the genre, even if they took off a dozen years. I really had a great time at this show. I talked with a fan of this blog, Josh, for a bit between sets which is always cool. It always surprises me when people come up to me and recognize me from the site, I’m glad some of you seem to be enjoying it. I also pulled a promo poster off the wall that I got all of the guys in Cynic to sign for me after the show. I’m not usually a big fan of autographs but I wanted something to remember the show by that was a bit more distinct than a t-shirt (I did buy the sticker pack too). 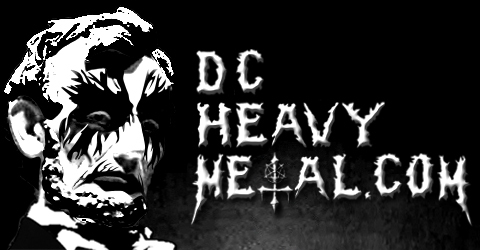 This show was just what I needed, after a few let downs (the cancellation of the Enthroned concert last week as well as the mediocre Iron Maiden show last month) this show really hit the spot. All three bands were excellent and I’m glad I got to be there. Now on to the videos. They’re a bit dark but the sound is decent in them. The first is Dysrhythmia, the next two are Intronaut and the rest are Cynic, enjoy. I saw them at their last show of the US headline tour in Ft. Lauderdale. They blew me away! These guys are amazing musicians. It was quite a concert. I agree that they’re one of the best bands out there.